Since Nintendo’s patent on the Famicom expired in 2003, rogue companies no longer have to fear Nintendo suing them into oblivion. Free from fear, one of the first legally produced Famiclones also happens to be one of the best. When it comes to Famiclones, this one leads the pack. 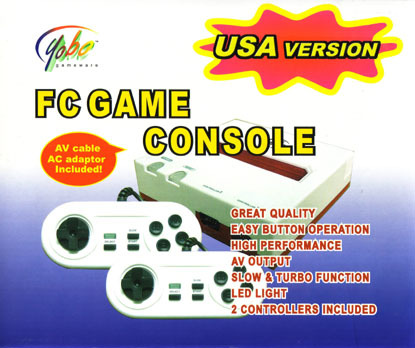 The Yobo FC Game Console is the North American version of the Japanese Famiclone known as the Neo Fami, with some interesting changes beyond its name. 1. Famiclone built on the noac archetype. 2. Built in 72-pin connector to play NES games without an adaptor. 4. Controller ports designed just like the real NES; you can use real NES controllers. The system is small and light. It’s available in many colors, but probably the one you want to get is the red/white one, which helps capture the look of the Famicom. 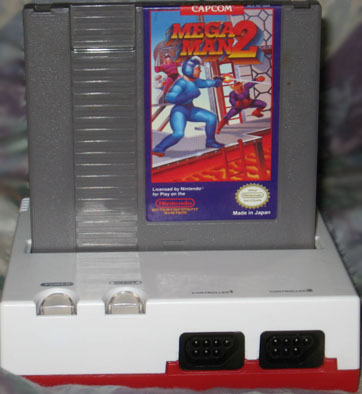 It’s top loading and features a built in 72-pin connector that services North American NES games and actually requires an adaptor to play Famicom games. 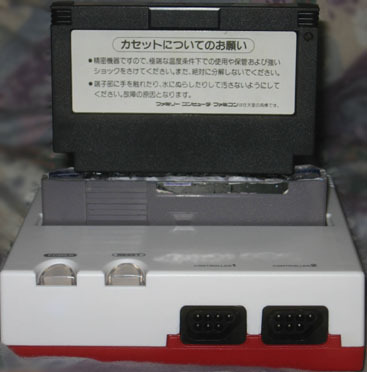 The connector is high-quality, eliminating all the problems of the NES’s blinking screens forever. The system performs flawlessly — much, much better than you would expect of a typical Famiclone. Whereas the Japanese Neo Fami used standard 9-pin pirate controllers, the design has been changed for the 7-pin controllers that the actual NES uses! This means that if you don’t like the controllers the system comes with (which feature slow-motion, just like NES Advantage, and an LCD light, for some reason) you can swap them out for any real NES controller; the standard, MAX, Power Glove, Advantage or NES2 dogbone all work fine on the Yobo. The Zapper works perfectly as well. Not to anyone’s surprise, the system features AV output instead of RF. What might surprise you however is how good it looks overall. The visual difference playing games on the Yobo and that of the real hardware is negligible. It’s highly impressive. The signal is still just AV, though, not component or anything. There is still room for improvement in terms of visual quality. Not so impressive is the sound emulation of the NOAC. For some games, background music and especially sound effects sound odd and out of place. For instance, Super Mario Bros.’s coin collecting sound is higher pitched and seems to drag longer than it should. Some games audio ques seem to be slower or faster as well. That being said, these problems are few and far between. Most games sound exactly the same as on the original hardware. The Yobo plays every Famicom game FW tested on it. It plays all NES games we tested, too, with one exception: Akumajou Densetsu. It’s unclear what’s so special about this game that prevents the console for playing it. This is a minor problem, though. If you absolutely must play Akumajou Densetsu, this isn’t the console for you. In addition to the system, two controllers and AC adaptor, the system also comes with a Famicom adaptor, though not one you can use with the console. The adaptor it comes with is a 60-72 pin, Famicom-to-NES adaptor which is pretty much useless because the Yobo is an NES, not a Famicom. What would have made more sense is a 72-60 pin NES-to-Famicom adaptor. The reason for this is probably an oversight on Yobo’s part; The Neo Fami would have used the 60-72 pin converter. Ability to use real NES controllers. No matter how you slice it, it’s a Famiclone. 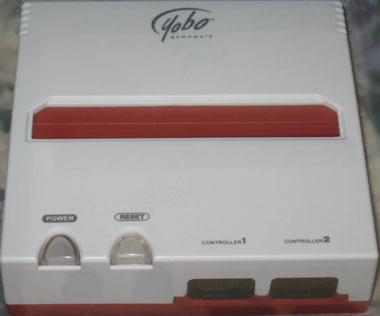 The Yobo is recommended to people who want to replace their NES or even those just getting into it. It is probably the best Famiclone on the market in terms of performance and price. The Messiah NEX costs twice as much and isn’t really any better. Yobo's console doesn't really have a name.